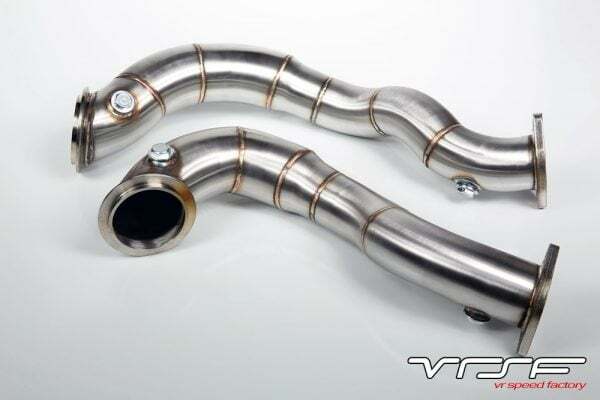 We are proud to introduce our VRSF 3″ catless downpipes for your 2007 to 2011 N54 E90 & E92 335xi. 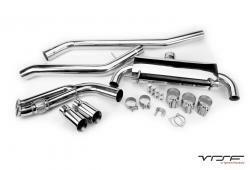 These 3″ downpipes are THE best bang for the buck mod available, with gains ranging from 25-30hp when tuned. 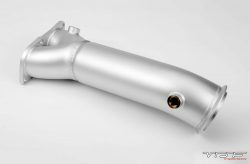 By eliminating the restrictive catalytic converters in the factory downpipes, back pressure is reduced significantly which results in faster spool, an increase in power & a more aggressive exhaust note. Our 3″ downpipes are hand crafted from SS304 stainless steel and include a lifetime warranty & our No Hassle satisfaction guarantee. Grade 12 installation hardware and two mid pipe gaskets are included with purchase. Please note that we offer additional installation hardware. 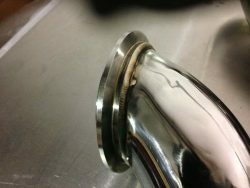 We recommend replacing your turbo clamps and gaskets every 60k miles. 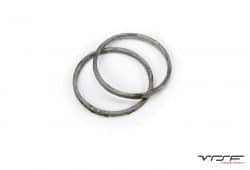 Made from mandrel bent, tig welded 3″ Stainless Steel. I have an Xi and because of that there aren’t many options in regards to our downpipes. I’ve been waiting for an affordable set to come out that’s still good quality and I knew that would be the VRSF’s. When I received the pipes I looked over the welds and they seemed very nice especially considering these were a test fit set, not a production set. The FMIC also looked very well constructed and came with everything needed to install. After getting the car back today I did a few pulls on the way home and definitely noticed a difference. Boost was building up much faster than it did before and the car was pulling much harder up top. It was also nice to be able to do repeated back to back pulls without the car heatsoaking. The DP’s also added a good amount of sound. I was actually surprised at how much of a difference they made to the exhaust note since I have an E90 with secondary cats and resonators. They also made the turbo’s much more audible then they were before and I can now hear them spool up even during normal driving. VRSF Catless DPs are awesome. Have been running them for couple of weeks. Great power and the quickness in spool is addicting! Got mine installed maybe 2 months ago, great power and the quickness in spool is addicting. Also whenever I hit the stop/ start button it sounds amazing. I love my VRSF downpipes!!! I love my VRSF downpipes!!! Makes the car sound so nice! My VRSF went in perfectly. No issues at all. And I have xi. They are also half the cost. Fitment was amazing and holy hell turbo spool install is a pain though. Thank you for a great product way more affordable than AR which is only 5 minutes from me. First off the downpipes shipped within 4 days of the purchase order. I drive a 2009 BMW 335xi purchased these downpipes because of the great reviews I’ve read and let me tell you that they do not disappoint. The sound (exhaust & turbo spool) and power increase were very noticeable and enjoyable, especially when going WOT. The installation, however, was rough. This was probably my own fault for not doing enough research for installation on the “xdrive” model, but it took my friend and I about 9 hours to install. The biggest problem was that the xdrive BMW’s have an extra support brace (welded in place) located right below the downpipes, making the removal of the existing downpipes impossible (without cutting anything). Thus we found that the only way to rightfully install the new downpipes was to drop the sub frame in order to make enough room to slide the existing downpipes past the dreadful support brace (this decision was made about 4 hours into the installation process after realizing what we had gotten ourselves into). One way or another we managed to successfully install the downpipes and they have been glorious to drive with. I drive my BMW for 2 hours everyday – roughly 200km per day – and have had these installed for about 2 months and have had no problems, only joy. As a conclusion I would recommend these downpipes to any 335i owner, the sound and power gains (especially with my newly installed JB4 tuner) and incredible; just beware of the work ahead of you if you have an xdrive model. Ordered these and had them within a day. Installed them the next day and wow the response from the engine is amazing! I am also running the 7″ FMIC and the sound and power was more than I expected. Very happy about this mod and I am looking to add the Exhaust next to increase the sound and decrease my weight!!!! This is one of the first mods I have done to my 2010 e92 335i xDrive. I had these installed by my BMW technician and he commented how nicely everything lined up and how there was almost not struggle getting everything bolted together. Not only that but he noticed the bolts that came with the kit had the same pattern as the original BMW bolts which is nice. When he first started the car, I was completely intoxicated by the noise that came out of the exhaust. I have the BMW Performance exhaust so the exhaust note was especially intoxicating. Something I definitely wasn’t expecting! The downpipes made all the difference here. Upon first driving the car (without a tune) I immediately noticed that the car spooled much faster and overall felt more responsive. Whether it was a 10-40mph pull or a 60-100mph pull. Didn’t matter, the car was pulling all over the place. Once I got the car tuned (Cobb stage2+), I noticed my MPGs went down…because I could not stop wanting to push the gas pedal! Unbelievable acceleration, response, I could hear the turbos spool up really nicely, it is all around just amazing. 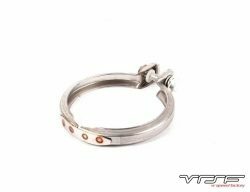 The short story is that if you are looking for a product that can increase power, increase responsiveness, while also making your exhaust sound like a true sports car, look nowhere other than VRSF for their impeccable downpipes! As many others reported, the installation for the xi is difficult as you must drop the subframe. This required several hours of labor, more than anticipated. Although, the fitment was great, just like OEM. The result was great. Not too loud, but a great volume. Still sounds like a refined Bimmer. 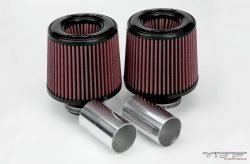 I do recommend getting a tune with these otherwise you are not getting your money worth. Overall, the price you pay is definitely worth it. I give the actual product quality and result a 5/5, just keep in mind the installation is a headache. Hey guys – I just wanted to drop you a quick note to let you know that the DP’s and charge pipe I purchased fit very well and that I am very satisfied with your products. Great job and keep producing! Next on the punch list is an intercooler – looking forward to it. Super quick shipping, great fit. Ordered my downpipes on a Monday evening, had them in my hands by Thursday afternoon. Car sounds great with the relocated inlets and downpipes. 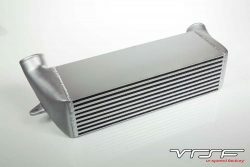 Will definitely be purchasing vrsf intercooler and charge pipe soon. Thanks. Great fitment and price. Noticed a significant power gain after installation. Sound increased and added a little bit of raspy(ness) behind the rest of my stock exhaust, but was not too loud. Tiago is a pleasure to do business with. Low cost and great customer service do not usually go hand-in-hand. VRSF portrays that and that’s why I’m a repeat customer. Installing these went smooth and fitment was perfect. Thank you vrsf for a wonderful set of pipes! Effort To Install – 2/10 if you have an XI lol. You have to raise the engine and drop the sub-frame. In the end, fantastic gains for the price. I would highly recommend. Great Product! Install Tricky but worth it! Installed these dropping the subframe, (a bit of a pain) But, power is truly unleashed now. No restrictive Cat’s in the way. Great quality, great fitment and the price cant be beat! 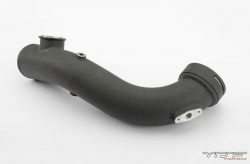 This is probably the best product you get for your money on the BMW n54 scene. The installation went easy with the only problem was stripping one of my bolts on the turbo exhaust flange. Otherwise it was painless. Would definitely buy again. Install on this was honestly not bad at all i did it on the floor in my garage and the whp gain is definetly noticable and the sound is great ive bought plenty from vrsf and am satisfied everytime. Got my DP quickly. The box had a little damage but was packaged well. Will definitely do business again, in fact I’ll be buying a fmic in the near future. Ordered these and had within 3 days! Install was a little but tricky in the XI due to having to drop the subframe, but the pipes fit great once I got that out of the way. Car sounds great but not obnoxious at all. Would definitely purchase from again! These fit perfect. If you have the x drive , there is a center support bar welded in the way. SIMPLY CUT OR SAW OFF this bracket! After the install, it can be welded back on ! That simple ! Charge was $20 + $5 at a local shop. In all honesty, I was sent the wrong downpipes (for a 335i model), instead of the 335xi (AWD model). 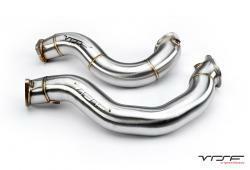 And VRSF immediately sent over the correct downpipes! I am impressed with the turn-around time! Great service. 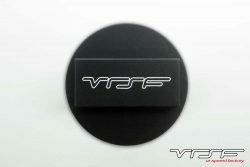 I also followed up with an email regarding the silicone outlets fitting, and VRSF, again responded immediately. I really appreciate the great customer service! Not yet installed, but the quality of the product looks amazing. And the delivery was fast, took less than a week for the shipment to arrive to Finland. Good business to deal with. I bought products for my previous 335i and was quick to help me when I needed. Now that I bought another 335xi, I went to them without hesitation. This downpipe is perfect fit, and works as expected. Quality product! These downpipes are awesome! They are built with quality in mind. They fit like a glove and have very smooth angles while reasonably priced! I highly reccomend them! Vrsf Downpipes fit perfectly. Sounds amazing and added a good amount of power.. Can’t wait to order a intercooler. Don’t have these installed yet but shipping was fast and parts look amazing! Finally got around to getting the silicone inlets, silicone outlets, intercooler, and downpipes installed (e90 335xi auto). Everything fit (in all honesty it was a snug fit). And the car has picked up quite a bit of power. I am extremely happy with the products and quick shipping from VRSF. Fitment was perfect on my 2009 335i xdrive. Install on xdrive models is more difficult and requires dropping the sub frame. Car has a bit of a lower grumble on stock exhaust. Thank you to vrsf for making a downpipe option for us xdrive owners, especially one that fits absolutely perfectly. 100% would recommend.